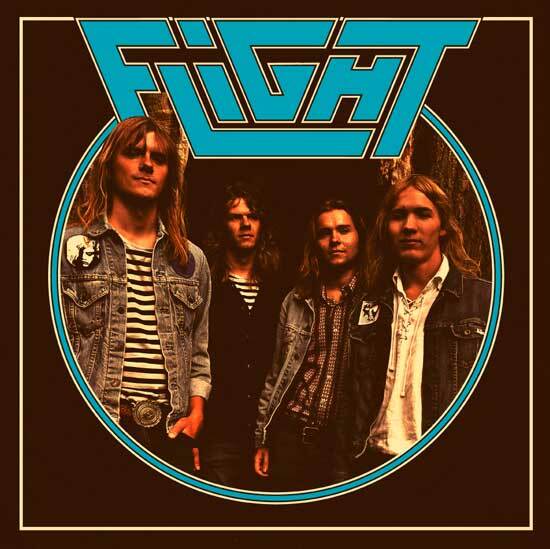 Flight are a new heavy metal band from Norway whose purpose seems to be to hearken back to the classic metal era of the early nineteen eighties. And insofar as that is their purpose, they certainly have succeeded at it – in spades. The lineup is simple: a drum kit, a bass, and a couple of guitarists who trade off riffing and playing solos. No keyboards, no synth effects, no harmonies. Just basic, old school heavy metal. But inasmuch as that has been the recipe for a good number of metal acts, you need more than that to make a compelling album. The guitar riffs are fuzzy albeit slightly muted and the vocals strongly resemble those of the old Swedish rockers from Heavy Load. But beyond the vocals themselves you probably won’t find too many similarities between Flight and Heavy Load. However, like their Swedish predecessors, they do tend to favour a far more understated approach to their lead playing. You won’t find any fretboard gymnastics here; in fact the soloing is more closely akin to a lot of seventies-era rock bands than it is to the speedier and flashier soloing that many of us have come to expect in heavy metal. This isn’t a detraction at all though, as good lead guitar playing has nothing to do with mere speed. The first half of the album is nothing to write home about. None of it is particularly bad at all, but even after repeated listens I found much of it to be forgettable. “Lion’s Den” and “Don’t Lose It” are certainly the stronger tracks of the first side as they showcase some decent songwriting and arranging, something that the others are severely lacking in, but even they don’t have any really strong or memorable aspects to them. But the second half is quite different from the first. Not in style, particularly, since the overall sound doesn’t change in any noticeable way. Instead, the change can be summed up quite simply apart from style or sound: it’s just better. The riffs are more memorable and the vocal hooks sink in a lot deeper. The album’s highlight track “Nightrider” kicks off the second side, and it’s a blazing tour de force of epic instrumental metal, full of changes in pace, dynamics, and tone. The remainder of the second side moves right along in its wake and songs following it live right up to the high standard set by “Nightrider”. I feel that for their first release, Flight would have been better off releasing the second half as an EP rather than issuing a full length with what is basically filler on the first side. I usually prefer full-length albums myself when it comes to my listening habits, but I am far more likely to spin a strong EP than a half-dull LP. I look forward to seeing what Flight can do in the future as they certainly have the backbone of a strong heavy metal band. This particular release, however, has too much weak material on it to warrant repeated listens.